Adaire Klein was born Adaire Schwartz in Leavenworth, Kansas in 1931 and grew up in Columbus, Ohio. She attended Hebrew School throughout her childhood there, and as her high school graduation approached, she had hoped to pursue Judaic Studies at Columbia University. Around this time, her parents noticed an article in the New York Times about the establishment of Brandeis University. When Adaire realized that she could pursue a degree in Hebrew and Judaic Studies on the fledgling campus, she decided that she wanted to attend. 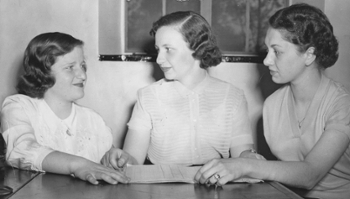 Brandeis was still a very young institution when Adaire arrived on campus, but many of the values that define university today were already taking root. Students maintained very close relationships with faculty, and Adaire would eat Shabbat meals with her faculty advisors while having class around their dining room tables. Abram Sachar, Brandeis’ first president, knew all of the students. “If you passed him on campus, you were greeted by name,” she says. 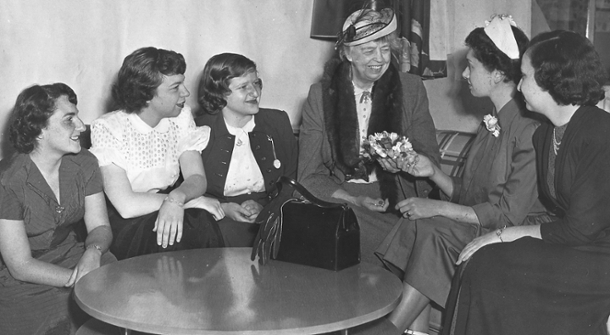 Adaire majored in Hebrew Literature, and she was very active in the extracurricular activities, including the United Nations club, which received frequent visits from Eleanor Roosevelt. After graduating from GSAS, Adaire worked as a teacher in New York City until she and Manny moved to California 1973, where they would remain for the next forty years. Adaire was working at Sinai Temple in West Los Angeles, which propelled her career in new direction: the world of libraries. The synagogue had a magnificent library, and Adaire and started taking on responsibilities there and at another library in Encino. In 1977, the Simon Wiesenthal Center opened a museum in Los Angeles. Adaire heard that the center was opening a library to support the museum, and she applied for the position. Based on her experience as a librarian and the depth of knowledge she had acquired at Brandeis, she was offered the job, a role she would keep until the end of her career in 2012. Adaire didn’t have an office or a telephone during the first few weeks, but she was given two boxes with about 50 books, mostly about the Holocaust. The 1970s was a providential time for curators of Holocaust material, as many survivors were publishing their memoirs and donating their ephemera. As the profile of the library grew, people started donating books and family collections. One of these donors was the man who knocked on the door of her office in 1992. Many people are surprised to hear that some of the books contained in the library were written by Holocaust deniers. Holocaust denial was a little-known movement at the time, and Adaire found processing these books very difficult. Initially, she kept them in the back room, “hoping it would go away,” but the books would turn out to be very useful in years to come. One frequent visitor to the library was fellow Brandeis GSAS alumna Deborah Lipstadt, M.A. ’72, Ph.D. ’76, who reviewed these materials during her research for her own book, Denying the Holocaust, which was published in 1993. A British historian, David Irving, sued Lipstadt over his portrayal in her book. Denial, a film about the legal battle that ensued, will be released in the autumn. The archives contain many other notable materials. When the survivors of the Mauthausen concentration camp realized they were being liberated, they took scraps from uniforms and Nazi banners and put the pieces together to create an American Flag. “They were all agreed that there were seven red stripes and six white stripes, but they were not sure how many stars there were,” says Adaire. “So it became the flag with 56 stars.” Other artifacts included letters from Anne and Margot Frank’s pen pals in Iowa. “These are the kind of things that are so important,” says Adaire. “Children learn in particular when they can see and touch, while hearing the adjoining story from history. We are able to take the items and memorabilia and let them speak for themselves.” Wiesenthal himself visited the center a number of times, and they inherited a few items from his extensive personal archive when he died. The influx of material has tapered off because so many survivors have passed away, but they still regularly host Holocaust survivors who speak about their experiences. In spite of being in Los Angeles for forty years, Adaire has maintained ties with Brandeis. Part of her education efforts at the museum included videoconferencing with school children around the world. Brandeis was involved in one of these efforts in 2009, when the museum hosted a conference with Claire Nivola, the author of Planting the Trees of Kenya. Students in Los Angeles and Kenya joined the conference, but Nivola could not come to Los Angeles. She lived in Newton, MA, so Adaire asked Brandeis to help. The university provided the necessary video technology and invited their own Kenyan students to join the conversation. Not only did the children in Kenya enjoy seeing Nivola, but also seeing their peers at an American university. “The teachers in Kenya said that the children were so excited to see college students from Kenya on the video,” says Adaire. Elie Wiesel, a celebrated holocaust survivor and recipient of an honorary doctorate from Brandeis, passed away earlier this year. During a visit to Buchenwald Concentration Camp, Wiesel told President Obama, “Memory has become a sacred duty of all people of goodwill.” Perhaps no Brandeis alumna has done more to embrace this responsibility than Adaire Klein.